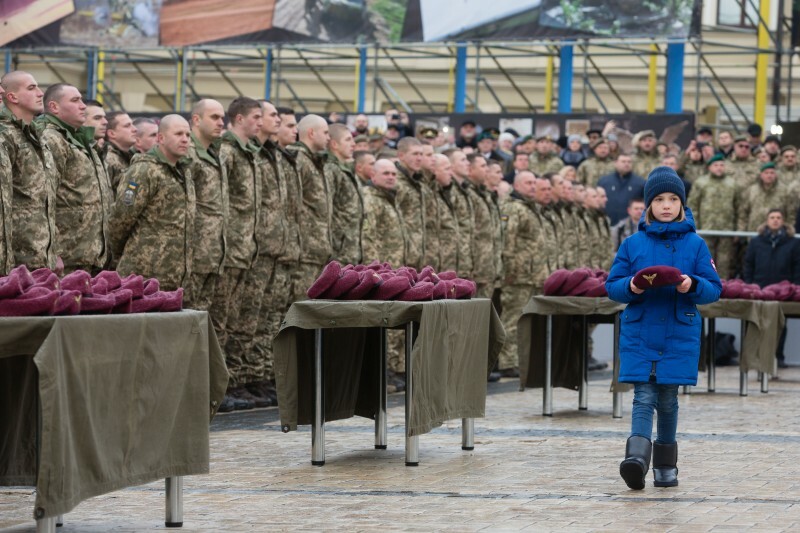 A solemn ceremony of taking oath by Ukrainian paratroopers was held in Kyiv with participation of President Petro Poroshenko. In the course of the ceremony our warriors received new berets. 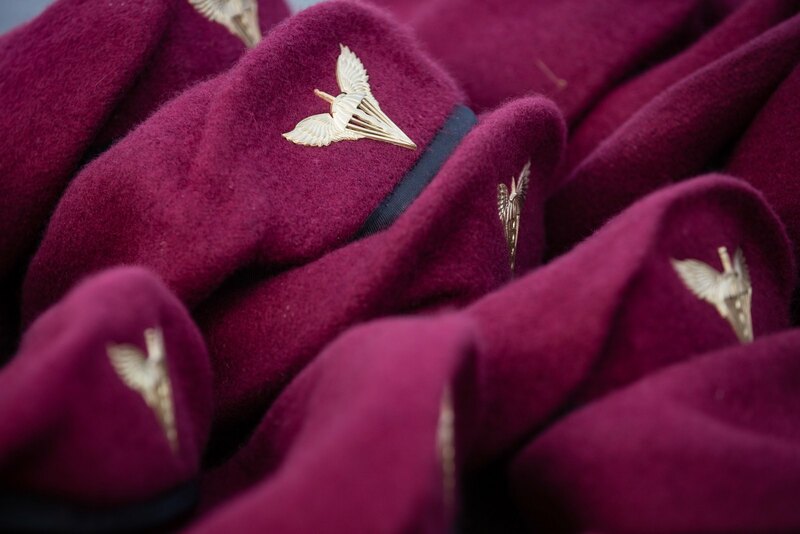 “From now on, the color of Ukrainian Airborne Forces is maroon. It is the color of blood of paratroopers shed in battles for Ukraine,” Petro Poroshenko said. The Head of State noted that “maroon berets for the identification of their paratroopers are used in 59 countries of the world, 19 of which are the members of NATO”. “Hence, we implement another NATO standard and I intend to make Ukraine its member,” Petro Poroshenko said. Addressing warriors-paratroopers, the President emphasized that Ukraine increases the combat potential of paratroopers’ units that receive new and modernized samples of armament and military equipment. However, he noted that “as a result of hybrid nature of the present war, we shouldn’t forget about its ideological component”. “The enemy has mastered techniques of psychological influence, skillfully exploits stereotypes, speculates on memories of the past and emotions associated with that. But doesn’t anyone of us understand now that the legendary airborne fraternity, whose symbols were "blue berets" and "striped vest", was killed by Russian invaders near Sloviansk, Donetsk airport, Ilovaisk and Debaltseve? What would 469 killed Ukrainian paratroopers say to this question, if we could resurrect them?” the President said. The President recalled the modern history of the Armed Forces of Ukraine and emphasized that there is no page in it, that doesn’t mention paratroopers and their feats. “You became famous in battles with the Russian aggressor for Karachun and Savur-Mohyla, in the defense of the Donetsk and Luhansk airports. The paratroopers fought heroically for the release and maintenance of strategically important objects and settlements, in particular: Lysychansk, Sloviansk, Kramatorsk, Krasnyi Lyman, Rubizhne, Sievierodonetsk, Bakhmut and many others,” Petro Poroshenko said. The President said that for courage and heroism in battles with Russian invaders, 2557 paratroopers were awarded state awards. Twelve of them received the Star of the Hero of Ukraine. 469 paratroopers did not return from combat missions, died in fierce battles with Russian invaders. The participants of the ceremony paid tribute to the memory of the dead Ukrainian heroes with a moment of silence.